The back of my house is bare. I’ve begun designing a new deck for the house. My goal will be to use principles that will apply to all DIY deck design. 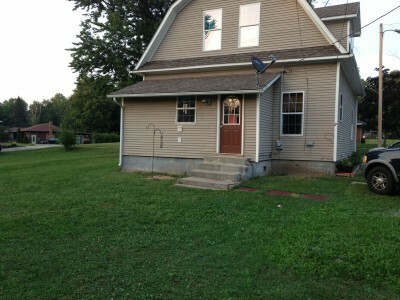 The first step I’ve taken to design my new deck was to take a picture of the house. This is the photo I decided to edit to make a sample of the deck. Before any deck gets built, I’ll work on a sample image to get an idea of what it will look like. I haven’t taken any measurements yet other than that my door is 31″ wide, and the siding is 24″ from the ground. As of right now I am thinking the deck will be the width of the entire back of the house. There will be stairs on the right side as well as the near side. The left side will be an L-shaped bench with railing behind. My next step after gaining a mental image of what I want is to find the lines of perspective, extrapolated from the sides of the house. Then I can draw a deck using the same planes as the house. 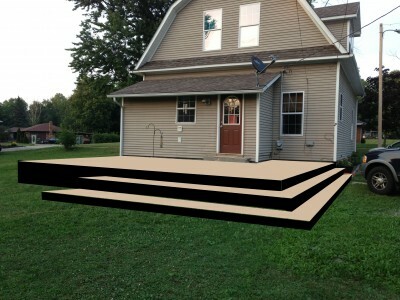 This next image is that of my DIY deck design with only the platform idea in place. I haven’t bothered at this point with making the deck look real. I also think that with the platform at 24″, I will need another stair. The main idea that I’m going for is that with wrap-around stairs, no railings will be needed, except behind the bench to the left that has yet to be designed. In following posts I will design the pattern for the deck boards, the stairs, and the railing with bench. Once I have a working image, I will take full measurements and start working a “blueprint” 2 dimensional scale drawing of the deck.